Masterful Color by Arlene Steinberg is the latest of at least a dozen excellent how-to books I own on colored pencil realism. 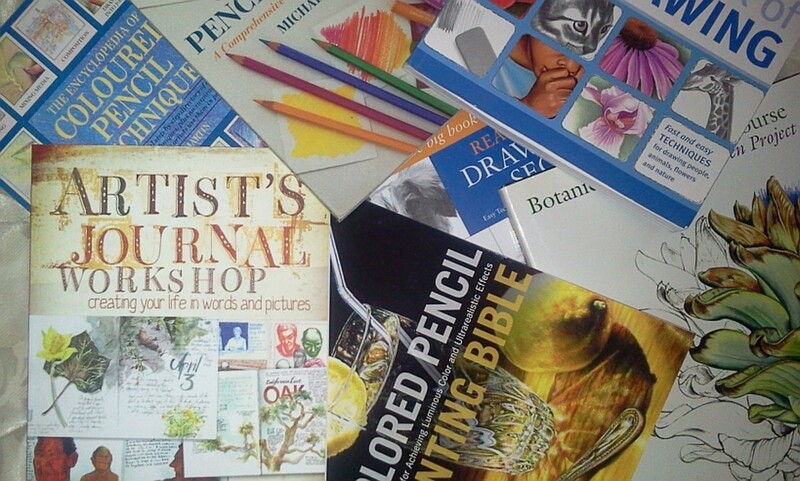 I've got several of Gary Greene's volumes, several of Bet Borgeson's volumes, Painting Light with Colored Pencil by Cecile Baird, Colored Pencil Solutions, Colored Pencil Explorations, the Encyclopedia of Colored Pencil Techniques, and more. A good chunk of my art book shelf is dedicated to colored pencil books. Yet this one did something rare and wonderful. It changed the way I look at Prismacolor painting. I've been using colored pencils since 1971 and started with Prismacolors. I've been a professional artist and sold colored pencil realism pieces for three-figure prices. Yet when a new book appears that takes everything I know and turns it inside out, transforming everything I create after using it, that book is pure joy. I wasn't a beginner. But I do remember what it was like first learning how to use a photo reference or how to mix color, how to make sure an artwork has strong values or a good composition. All of the beginner material I was familiar with is presented well in Masterful Color, so well that if this had been my first and only colored pencil book I would've learned everything a lot faster. Way back in 1971 when I bought my first set of 72 Prismacolors, a little pamphlet came with it that had examples of works by professional artists, both fine artists and illustrators, as well as a color chart and a few pages of techniques. Its cover had a wonderful landscape with a reflecting lake, trees, mountains and clouds, very rich in detail and as realistic as any nature poster or oil painting in an art museum. I fell in love with the idea of doing colored pencil realism and struggled with years to learn burnishing, shading, all the coloring skills needed to create that kind of natural effect. Yet while I was good at color mixing and very good at using a large palette to create any color I wanted, I didn't see half of the possibilities that Arlene Steinberg goes into in her detailed, step by step demonstrations and excellent theory essays. Her artwork ranges from large colored pencil paintings to more manageable sized projects like the 5" x 7" still life of marbles, "I thought I'd lost them," that appears on the front cover. This is the exercise that inspired me, and because I'm used to using photo references that I don't have permission for and changing them so radically that I'm not doing someone else's copyrighted work, I simply used her reference and laid out my own arrangement of the marbles for the illustration of this article -- Robert's Marbles is my version. The effect this artwork has in person is something I would not have believed till I finished. It goes beyond photorealism. Her methods of complementary underpainting and meticulous layering, varying pressure and a constantly sharp point on Prismacolor Premier and Premier Lightfast pencils results in realism truer than photography. In that long-ago Prismacolor booklet, the author explained that translucent Prismacolors when layered have a luminescence similar to oil painting. Light bounces through the transparent layers at different angles to enrich the surface color and make it more vibrant. What Arlene Steinberg has done is make this rich luminous effect easy even for a beginner. Clear line drawings are printed in the final pages for all of her projects, so if you're not skilled in freehand drawing you can trace and recreate her art exactly for your exercises. She's listed each of the colors by name and recommended the right paper for the effect -- Rising Stonehenge. If you buy this book, I recommend you also purchase white Rising Stonehenge paper in a sheet or pad and Prismacolor Premier or Premier Lightfast pencils. You can either get large sets and have all the colors she uses, or choose a project and purchase the pencils needed for that project, but they are all Prismacolors -- Premier, Lightfast and Verithin. It's the special qualities of the Prismacolor core formula and the soft Rising Stonehenge paper that allow as many layers as needed to create this hyper-realism effect. I used to try to shorten the number of layers I used on colored pencil painting so as to complete it faster. Arlene Steinberg's methods are easy but they are not fast. This is a slow, careful and meticulous approach to colored pencil painting that's perfect for the sort of serious hobbyist who likes creating fine resolution cross stitch paintings, or other massively complex work in simple steps with good materials, carefully. The title is apt. 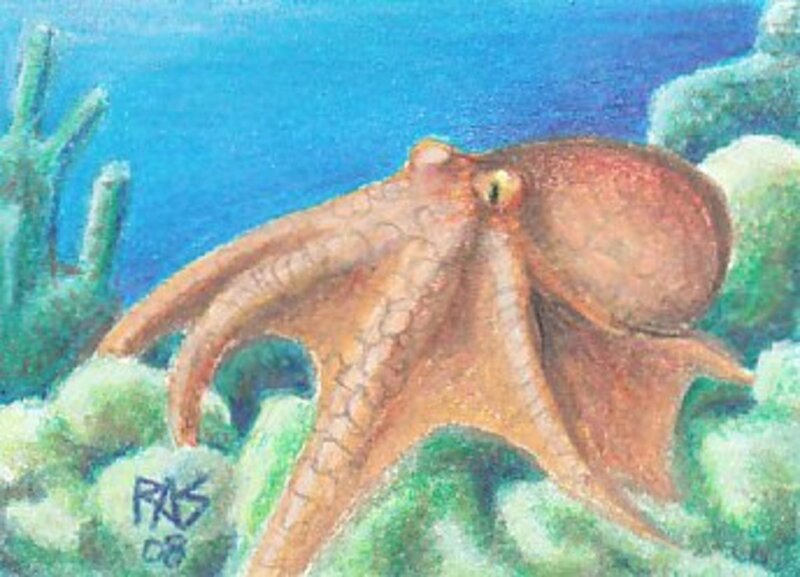 It is a mastercrafter's approach to colored pencil painting. Counterintuitive, the first layers of any work done with a complementary underpainting will look crazy, and sometimes look very bad. But patient layering will gradually bring the color up toward the true colors of your objects like watching a Polaroid develop itself, until at the end your painting has a brilliance that could not be achieved any other way. While the complementary pigment particles aren't obviously visible, their presence makes all the colors dance the way colors do when you look at red holly berries on green leaves at Christmastime. That vibrating feeling is there. Objects shaded carefully to give them form and light will have a liveliness to them that isn't there if you were to just carefully color the line drawings with the final colors. Ms. Steinberg includes a color swatch chart in the back of the book for each Prismacolor used by name and color number, and a color swatch comparison chart for underpainting complements by color groups. This allowed me to apply her techniques easily to subjects that weren't in her book, things I drew from life like my subsequent marbles still lifes. I had forgotten what Prismacolors can do, and grown too used to my time-saving shortcuts to remember what happens if you fill a black area with layers of complementary dark colors and don't use the black at all to build it. Arlene Steinberg brought me back to my first love in this medium and reminded me why Prismacolors are still the ones I've bought the most replacements for over the years. I will be testing the techniques with other brands of colored pencils as well, since I've only tried one other brand so far, and post the results of those tests in secondary capsules to this hub. But you can count on the best results using the brands she recommends. The book is a kick-start to experienced colored pencil artists, amateur or professional, and so well structured that I would recommend it to a raw beginner who can't draw a straight line. You can get good results with her projects as a beginner by carefully following instructions and using tracings till you learn to draw well freehand. Each skill needed in basic drawing is explained in a concise, easily understood way with excellent exercises and demonstrations, many of which make goodlooking small pieces even in themselves. Something like the tomato or the pears will make a good small addition to any country-themed décor, or could be framed and matted to a bright accent in a modern décor. This book is one of the best. Check it out from the library, buy it online or pester your local bookstore to order yours if they've run out -- it's selling well and has only been in print since around April 2008 if I recall right. Here's my idea on adapting Arlene Steinberg's techniques to pastel, Robert. I think that it mostly takes experimenting with pressure and how much you lay down, also with which pastels you use in what layers. Especially the color harmonies and principles of using complements both to mute colors and to give them zing can be adapted. It takes a different hand with pastels and pastel pencils. You may want to use an underpainting with your pastels, the Inktense would work as well for that as it would on colored pencils. 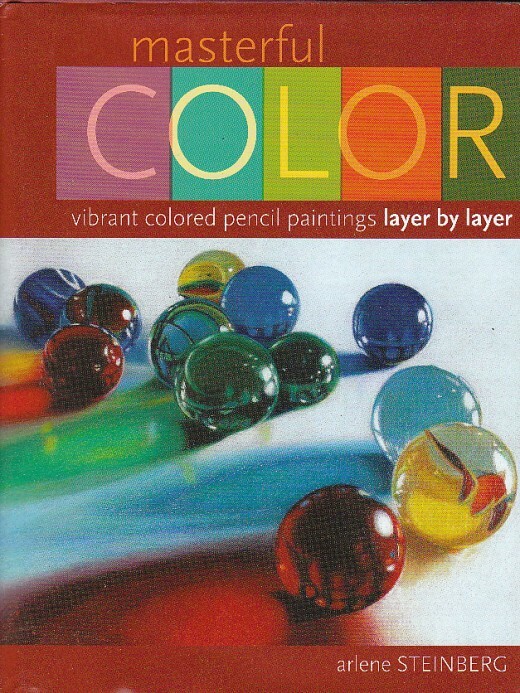 Specifically for pastels, I would also recommend the Pan Pastels from Colorfin LLC -- http://www.panpastel.com is the website for information about them. These make a wonderful dry underpainting for any kind of pastel work, especially if you use the big oval sponge to fill in large flat areas. Underpainting works better with the sponges than the plastic knives. I can get smooth flat or graduated layers in a very thin film of Pan Pastel on Colourfix paper or PastelMat or Wallis, then start going over it with sticks. Doing this sort of thing with pastels, the techniques are different. Going from hard pastels to softer brands allows easier floating layers of color over previous layers. PanPastel is one of the softest but also works well for the very first layer since you can lay in that smooth flat color with it. Then I'd use pastel pencils for the very last details. 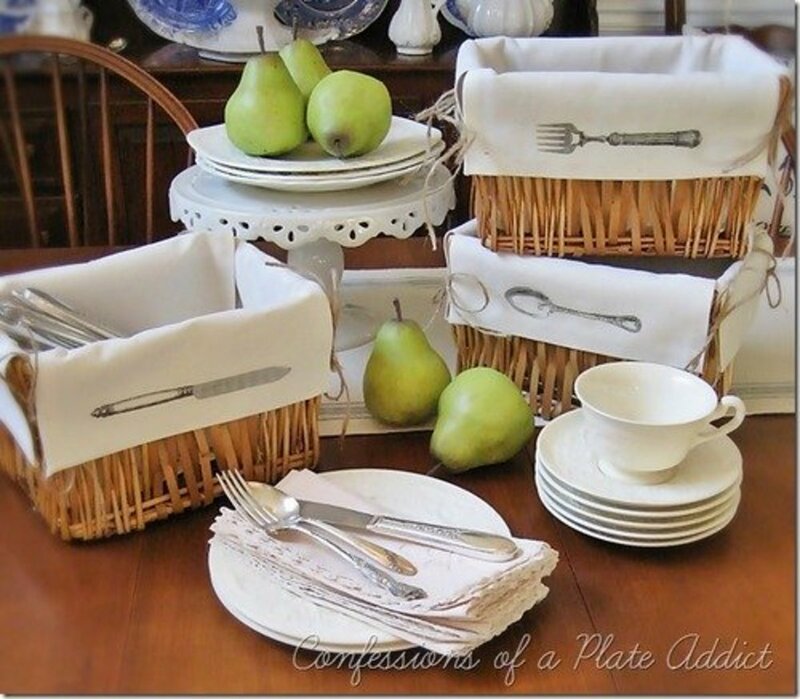 http://www.wetcanvas.com has a demo by Dianne Ponting of a candy dish that is absolutely scrumptious realism and she uses pastel pencils with a layered approach and color overlays and blending. Most of the pros blend with the sticks rather than fingers. Arlene, thank you so much for commenting in depth! I'm going to try the Inktense underpainting soon, probably in January unless I start really getting ahead of my current schedule - holidays are hectic and I need to finish editing a novel by the end of the month in order to meet a challenge. I will be testing your techniques and Alyona Nickelsen's techniques on the same project and possibly also get out a Gary Greene book or my Cecile Baird book at the same time -- doing a series on the same subject with different techniques all from accomplished realists ought to be fascinating. Your work has a unique glow and richness. I think that if I used the Inktense underpainting and then went to the complementary value layer and then overlayers, it would start going as swiftly as Ms. Nickelsen's techniques. I do have good ventilation here in my room with both a ceiling fan and a HEPA filter that has a fan, so I'm much less worried about fumes with either thinners or fixatives than I used to be -- the odor vanishes so fast now. There is also a new product I'm considering buying next month, a new fixative called SpectraFix that comes in a can without propellant, it's just a very fine mister, a proprietary mixture of casein (milk) solids and grain alcohol. This stuff may be a lot healthier than traditional thinner-based fixatives with propellants, both for the artist and for the environment. I'll have to see if it does as well at preventing wax bloom on Prismacolors as normal fixative and if it's as transparent. Have you tried it? If you have, what did you think of it? I absolutely love this way of drawing with color and wonder if you have advice for those who wish to get similar results with pastels? I have a very large collection of pastel pencils drawn from different manufacturers as well as a large collection of many brands of both hard and soft pastels. I use sanded pastel paper so I have no problem absorbing many layers. Any suggestions would be much appreciated. I had to add additional commentary based on the last couple of posts. Michael my instructions were definitely correct and were tested out by my students before the book was completed. As with anything, it takes time and practice. Also I find most people get hung up towards the end where I state in most of the lessons to continue layering color until you've reached full saturation. That just means to use the colors you used AFTER you did your underpainting. I hope I helped and if not, please feel free to ask me your questions by going to my website. The biggest problem I believe is what Robert alluded to and that is what is a #2 pressure. Unfortunately we (the publisher and myself) thought of doing a dvd after the book was almost complete and because it was already sold to the stores we couldn't go back and add one then. I would like to add one additional comment to those of you who are working with chemicals such as bestine. These chemicals should ONLY be used in a well ventilated area. I personally would never use them in a closed house. Even odorless mineral spirits are not completely harmless but they are much better than bestine. What I've taken to using lately is Derwent Inktense pencils. By using them, I do save myself several layers. I will take the main color (so to use the tomato example in my book) I will first put down a layer of red Inktense in the red areas, and green in the green areas. My preferred method is to rub the pencil on scrap paper, then with a wet watercolor brush pick up the ink and apply it to my drawing. Watercolor would also work but would not be considered for any colored pencil competitions you might enter. If you want strong color for the base, all you have to do is scribble on your drawing with the color, and then take your dampened brush to the pigment on the drawing. Hmm... that's interesting. Thanks for telling me that. I'm not a beginner and wasn't when I started with this book. I also didn't try doing any of the exercises verbatim, I made them my own even if I used her reference and drew on my own experience as much as the text. Might I suggest Alyona Nickelsen's "Colored Pencil Painting Bible" since you had that problem? I have done one of Alyona's demos and I can attest to the accuracy of the color listings and technique demonstrations. She also has a course -- the Colored Pencil Realism School. Let me get you the URL -- you can field test her work because she's got a free video and some text lessons up on the site. http://www.brushandpencil.com is her website in general. I've reviewed her book too and I posted my version of her Red Delicious Apple exercise -- okay, I did my version working from a real apple but I was doing it using her colors and methods. They work very well. The other benefit to Alyona Nickelsen's book especially for a beginner is that she goes into some techniques that Arlene Steinberg doesn't use. Arlene Steinberg's method is specific and wonderful, it produces brilliant results -- but there is more than one way to scan a cat and Alyona Nickelsen teaches all the short cuts you'll need if you want to get colored pencils realism in a dozen layers instead of two dozen. She uses odorless mineral spirits to dissolve some layers, which means you're not layering again and again until all white specks are gone necessarily -- they may still show up as colored textural specks. 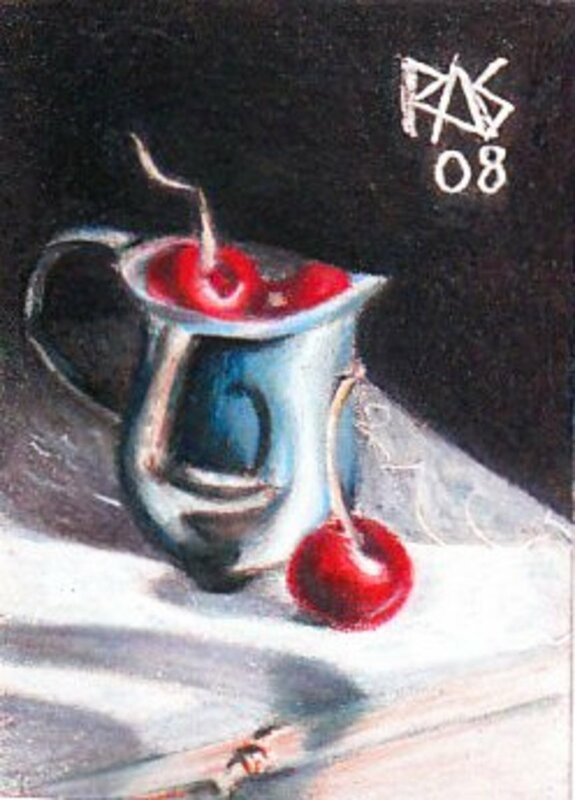 Her sketches are excellent and the examples are pretty simple for beginners -- simple and spectacular, the little brass jug one is gorgeous and so is that Red Delicious Apple. Check it out. Even if you just use the freebies they may help you handle the Steinberg material easier. Also take a good look at her course, because she does several classes a year and gives personal help and attention to all her students. The school rocks for another thing -- every class has a prize for a challenge project, the prize is art supplies donated by her sponsors, so that's pretty neat. If you do take the course, please tell Alyona that I sent you and also message me about it. I would love to hear about the class from a graduate. That school has tempted me so many times. I bought the book and went through it with a fine toothed comb. It looked great. Then I actually did her lessons and was disappointed. I am a beginner and needed explicit instructions. Some instructions were not right and a few of the pictures I traced didn't match up with her pictures and instructions. I was disappointed. I got the impression that this book was not proofread and tested before it was published. Yes, that is the correct link! Sounds like you'll have fun at your class. She has the offer for the second 100 special complementary DVD, Stonehenge sample and CD of images up now but it's sort of a preorder since she's awaiting another shipment of the books. She might be making these DVDs at home instead of having them commercially produced. I found her site when I used Yahoo search, for once my laziness in using the search engine that doesn't need me to go to it specifically because it's on my browser helped. lol. http://www.brushandpencil.com/ is the link again, might as well paste it a second time. My oil pastels site, if you want to read up on a good cheap sketch medium and another orphan fine art medium, is http://explore-oil-pastels-with-robert-sloan.com -- I found that I can use some of the colored pencils effects with oil pastels if I work quite larger and especially if I use sanded paper like Colourfix pastel paper or primer. Oh that is so much my bad! I mistyped. It should be http://www.brushandpencil.com/ not brush and paint, yeesh, no wonder you wound up on a different site. I blinked and thought this morning "Is it case sensitive?" Then searched on her name and clicked on her site. Thank you for mentioning that! So here is the good link to it. I am sorry. http://www.brushandpencil.com/ is her site. I will test this link after I post this comment too. Thank you for the last group of suggestions. I'll be trying them after I get the supplies. I also tried the website above at www.brushandpaint.com. It took me to a site about artists brushes, but there was no indication it was for the author of the book you mentioned above. The site may have changed recently. I did Google Alyona Nickelsen and her book. The book is now on my wish list. I would still like to buy it from her and get the DVD, CD, and paper sample. If you know of another link I would greatly appreciate it. Tonight and tomorrow I'm taking a watercolor class at a local gallery. It seems like a good way to get loosened up besides being fun to meet some local artists. Oh those are fun! I have a set of them and they're a lot of fun. It's a kick to get watercolor effects with the graphite sheen and color, to contrast wet and dry shading in the same drawing. Prismacolor work is a lot faster if you use solvents on some layers. They'll blend and form a colored underpainting. Arlene Steinberg's technique is the slow sure way of pure dry underdrawing in complementary colors. Gary Green, Cecile Baird and Alyona Nickelsen will use underpainting to establish tone by washing the early layers and then using dry colored pencils over them. The more different techniques you learn, the better. The water handle brush is a great convenience. I love mine, it's going to be tough choosing which of them to dedicate to using with solvents since I don't want to mix water and solvents trying to use them in the same brush. Keep one for washing the watersoluble graphite pencils and other watercolor pencils too, any watersoluble pencil you can do the same thing with clean water. Robert, thanks for the additional information on the book and the tips. I wouldn't have known to use the thinner nor thought of using that water-handle brush. I just looked at those today at Hobby Lobby but wasn't excited about it for just water. Got to open the mind more. Well, I'm new to the colored pencils so the idea of solvent with pencils is foreign. I did get some water soluble Prismacolor graphite pencils today. They will be fun to play with. Thanks, Diane! I'm so glad it was helpful. 72 colors is a good range, you'll probably have most of what Ms. Steinberg uses in the projects or colors close enough you can substitute them. Test any substitutions on scrap paper to see if it has the same effect you want. It's often possible to combine two colors to get the effect of a pencil you don't have. Another good book to look at is "The Colored Pencil Bible" by Alyona Nickelsen, another colored pencil realist using Prismacolors. She has a different technique and if you order her book on her website, http://www.BrushAndPaint.com she has a special offer that includes a DVD of her doing one of the projects plus a Stonehenge paper sample and a CD with the photo references and outlines for the projects in her book. I've seen the video and it's excellent for demonstrating some of what Arlene Steinberg talks about with pressure -- pressure is very important with colored pencils realism. You have to go lightly in early layers to be able to get the luminous mixtures of many layers and then burnish toward the end. It's also possible to use mineral spirits or Bestine rubber cement thinner or odorless turpentine/turpentine to dissolve the color and get a wash effect. The Prismacolor clear colorless blender marker also dissolves the pencils easily and is very handy. Ms. Nickelsen uses an odorless thinner and puts it into one of those nylon water-handle brushes for watercolorists, which I never thought of but seems so convenient for wash layers using Prismacolors. I should probably take one of my brushes and load it up with that the next time I do a colored pencils realism project, it'd be so convenient to keep it handy. Okay... I can't actually edit my previous comment, but I take back recommending Verithins for it. Prismacolor Scholar will not work for that technique. I bought some for my granddaughter and tried them. Ms. Steinberg recommends Prismacolor Premier and Prismacolor Lightfast, and purchasing the colors individually per project -- which is a good way to go without a big initial outlay. It takes some time to complete one of the projects, even if you have a lot of time to put into it. I got the big set because I wanted it, not because I needed it to do the projects. I use all the colors because my habits are different and I know I'll use them all, whether or not I actually use them up. This is because I change subject so many times and got into a habit of using a long color as an idea prompt to decide what to draw when my old set got short. I have not, to date, gotten those results with any brand other than Prismacolor Premier and Prismacolor Lightfast. Trust the author. She knows what she's talking about, and it seems my personal experience with a lifetime of Prismacolors blended in a little with her book, since I started burnishing with White years before the Colorless Blender was invented. It's possible to do it without changing the hue, but you have to go over it with the color again afterward, using White. Wow, thank you, Arlene! I am honored that you commented on my review! Folks, she invented the method and knows what she's talking about, I'd listen to her advice over mine hands down. That is the author. 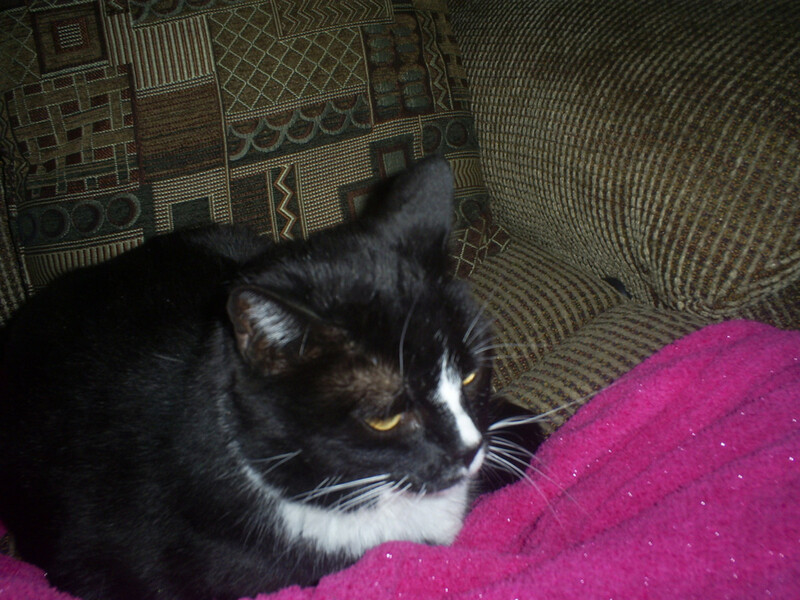 She is a lot better than I am and is the source for this book that revolutionized my art. A friend of mine tried the tomato on the discussion thread where I first saw the book discussed and her results were gorgeous. It didn't have a very big color list either as I recall. Ahh. I didn't do my marbles exactly according to your palette then, I let the background get a bit dark and then burnished it with white, which brought it right up to the value I wanted, then gave it an additional burnishing with a colorless blender. I've burnished with white or light colors on a lot of my projects in the past, and I guess old habits die hard. It also shows my age, since I was playing with Prismacolors long before they invented a Colorless Blender and loved burnishing with all the light colors. But the Colorless Blender does work better without changing values or hues and there are other ways to add sun and shadow in earlier layers. I haven't heard of the Luminescence pencils yet! Which manufacturer makes them, is this a new Prismacolor product or another brand? They sound great! First I'd like to thank Robert for a wonderful review. it's so satisfying to hear that my solitary efforts creating the book have paid off in others finding it useful. I am enjoying his blog and his experiments. I'm so glad the book has gotten him to try new things and to experiment. As can be seen by his results, he's taken and run with it. I do want to make some corrections though. The best brand to use for my techniques is either the Prismacolor Premier or Prismacolor Lightfast pencils. I'm told the new Luminescence pencils will also work well, but I haven't tried them yet. However, the Verithin pencils while the same color, will not work. They're too hard to get the rich color layers needed. As for other brands, some work but others do not because they're too hard or they don't layer well. It's best to do as Robert has done and experiment yourself. My suggestion would be to pick one of the projects in the book, (if you haven't tried my techniques first, I would strongly suggest doing the tomato) and then get the pencils needed for that project. Then add the few you'll need for each additional project. I wouldn't buy the full set of 132 pencils along with the 48 set of lightfast pencils since you'll pay a premium for colors you'll probably never use. Out of the 132 pencils in the Premier set, I only use 64 total in the book. If you have experience working with color and understand the theories of color, you can definitely substitute other similar colors. Lastly, while I always use white to bring back highlights at the end, I don't recall using it to burnish. White over a color will lighten it. I always use the colorless blender pencil to burnish. Wow, thank you for a great comment! You'll love the book, it'll make everything so simple! I do want to make a comment here. I very much liked your work before you started with this book. The first piece I saw where it made a measurable difference was with the lilacs. That just dazzled the eye. And you know I love Robert's Marbles. Wonderful work and lovely review, you know I have this book on my list of to gets!! That's the nice thing about this book. If you have the time to get into it as a serious hobbyist and are very careful, following the directions, you don't have to be a good artist to get good results. You might become one from doing all the exercises, but you can get good results even on little or no experience as long as you have the right tools. So glad you enjoyed my article! 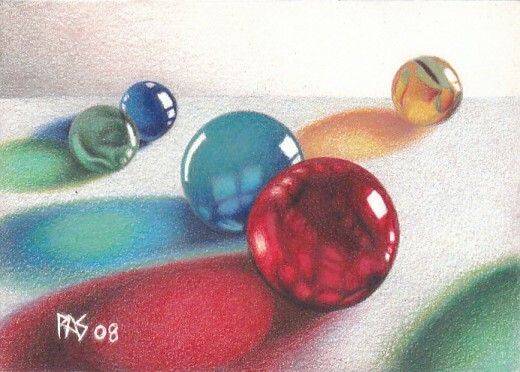 I'll be doing some further articles on Colored Pencil Realism in various ways, breaking it down into subtopics with demonstrations -- and where possible my demos will be done with a 12 color set of Prismacolors so that a casual hobbyist can try it with the smallest set rather than investing in a great big one. This sounds like something for serious hobbyist, which I doubt I will be (not good enough of an artist). But I really did enjoy reading your article, and subsequent comments. It's fascinating to learn that you can do so much with pencils. Prismacolor Art Stix are exactly the same core material as Prismacolor Premier. If you have a full range 48 color set of Art Stix, you have a set of 48 Prismacolors. Shaping them to keep a sharp point at all times takes using the corners of the square stick and rolling it in your hand. Wearing it down at a slant on a bit of sandpaper or by filling in a large area of color with light pressure where you're not going close to the edges will restore all four points at the same time. They are shaped like Conte crayons or something like that and woodless, very handy little things, but not available in the full 132 color range and they do not make them in the Lightfast range at all as far as I know. They are relatively longlasting, being woodless, and good for fill-ins on large areas but can be used for anything. It might be a bit inconvenient to use them in this technique but you can use colors in Art Stix to supplement the colors you don't have. Be careful to keep track of them with a color chart though, unlike the pencils, color names are not printed on them! The most labor-intensive but financially cheapest way to deal with buying enough colors to do it, would be to get a set of 36 Prismacolor Verithin pencils, which run about half the cost of Prismacolor Premier and are not as soft. That is the maximum Verithins set. Then do soft tonal layers with light pressure to create mixtures that match all the colors you don't have, plus add a Prismacolor Colorless Blender and a Prismacolor Premier or Premier Lightfast White. White is an important burnishing color in many of the paintings and burnishing is what would turn the hard-point Verithin layers into smoothly blended layers resembling those done with Prismacolor Premier. Verithin has the advantage of hard leads and holds a sharp point better, but you do have to be more patient layering with it and it takes more pressure to do the heavy-pressure layering. At the full saturation level, burnish early and repeatedly to simulate the effect of doing full burnishing layers with Prismacolor Premier, burnish with the Colorless Blender before doing a White burnishing layer if the exercise calls for White. The nice thing about that substitution is that Verithins are sometimes available in some stores that don't carry Prismacolor Premier, like smaller office supply stores and such. Trying this with Prismacolor Scholar is about comparable to trying it with Verithins, but while the range is broader, the pigment saturation is lower and it may turn out to be even more work. I'd recommend Verithins over a larger box of Scholars for it. I will be adding modules later on as I test other brands with these techniques and describe which ones work well with it or not. On any substitution, getting a Prismacolor Colorless Blender would probably help with the texture. The minimum set that I would use for trying to create something like this would be 24 colors. 36, 48 or 72 is better. If you want to have all of the colors that Arlene Steinberg recommends and produce the example drawings exactly the way she did them, then you'd either need individual pencils matching her colors -- some Lightfast, some Premier and some Verithin -- or the 132 color set of Prismacolor Premier plus the 48 color set of Prismacolor Premier Lightfast. However -- the nice thing is that substitutions do work and you can simplify a little in the layering if you're using a smaller set. One friend and student chose to get a 36 color set of Prismacolor Watercolor, and the range in that set would be enough that with a little care about the substitutions, she could get the effects properly. Be prepared to do more extra light pressure layers if you are substituting and using a smaller set, because you will have to create sub-mixtures to match the colors you don't have. Happily she does have the color chart for all the listed colors in the back, so you can do mixture swatches from what you do have to match those patches and then use both or all three colors where she would recommend one. Be careful to use very light pressure when doing more layers than recommended, use lighter pressure than she recommends so that you can get all the layers in. Rising Stonehenge will take fifteen to twenty light layers but once you start using heavier pressure, only three or four more will work. Spray with workable fixative if the drawing can't take any more pencil, that will get you one to three more layers by creating a layer of &quot;tooth&quot; for the pencil to stick to. The cheapest option would probably be to choose one project and buy those individual pencils. For example, the eggs and pot painting takes 25 individual pencils, versus getting the 132 color set. But if you plan to do multiples, finding a bargain on the 132 color set or on a 120 and the new colors set to supplement it might be a better choice. Nice review! Now, you know I'm a newbie artist, so could you give an idea of how big a set would be needed to produce an artwork like your marbles? You may have every color Prismacolor has produced in the last two years, but some of us are not so endowed with colored pencils. Of course, I could always just steal yours. . .